As I am sure you are aware, weather plays a very important role in bird migration. This spring, I will teach you how to read a weather map to try to predict areas where large numbers of migrants might be landing. Let's start by looking at the general features of a weather map. 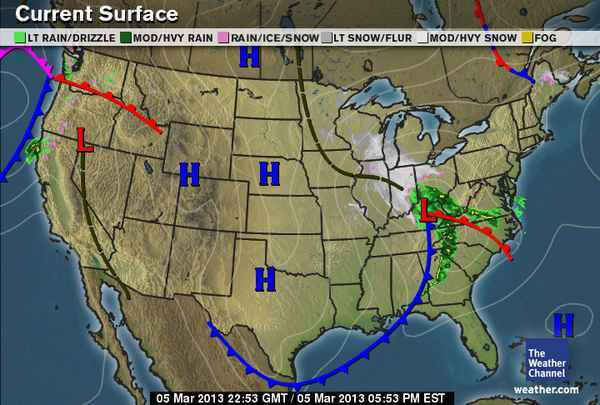 Blue lines represent cold fronts. There is warmer air ahead of the front (to the right of the blue line), and colder air behind the front (to the left of the blue line). Red lines are the opposite -- they are warm fronts, with colder air in front (to the right) of the red line and warmer air behind (to the left) of the line. Another component of a weather map you need to know about are PRESSURE CENTERS. The blue H's and red L's represent high and low pressure centers respectively, and are areas of swirling air. The air circulates clockwise around a high pressure center (H). The air circulates counter-clockwise around a low (L). So what does this all mean for birds? Birds want to fly with a tailwind, which is wind behind them to push them along so they use less energy and get where they are going quicker. In the spring, this means south winds (wind moving from south to north). Birds don't want to fly with a headwind. North winds (wind moving from north to south) make flight difficult so birds are forced to land. Bad weather, such as heavy rain, also forces birds to land. On the right side of a high pressure system, the winds are coming from the north, so migrants land. On the left side, the winds are from the south, so birds take off to continue migration. 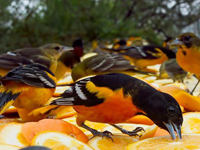 Since highs follow cold fronts, birds will be forced to land immediately following the passage of a cold front. After the high has moved east, usually a day or two later, the birds have tailwinds and take off again. So why don't birds use low pressure systems? Lows begin with south winds, but often bring bad weather too. So, even though the winds may be blowing in the right direction, flying conditions may not be good.